Here’s one last post in my series on the Loire Valley. Now that we’ve seen where we stayed and what we saw, this one’s about what we ate. A primeur is a young fruit or vegetable that starts off the season. This is what we were eating during our trip in April. 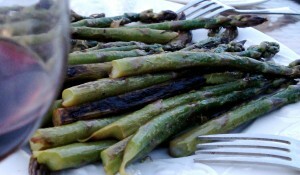 March through June is asparagus season in France and the Loire Valley is known for its production of this favorite. In France, you find asparagus in three different colors: green, purple or white. I grew up eating the green ones and was taught to search out the skinny tender stalks. I’ve noticed, however, that the fat white ones seem to be the most common here in Paris- I’ve actually been on many an excursion around town trying to find slender green asparagus without any luck. The white stalks are white because they have never been exposed to sunlight and are picked as soon as they start popping out of the ground. They are tougher than the green sprigs we tend to eat in the States and need to be peeled before cooking. Though I’ve tried, I still have a preference for the stronger taste of the green ones. Our most memorable meal was in Langeais at a restaurant called Au Coin des Halles (9, rue Gambetta). Here, I had bar (European sea bass) with seared asparagus and asparagus/lime sauce. At first I was a bit skeptical when I saw the color of the sauce: bright green like sherbet; but I was in asparagus heaven as soon as I started eating. Over the last couple of months, I’ve noticed that even Parisian grocers have been subject to the asparagus invasion. Looking in the grocery store today though, I sadly had to admit that the season has come to an end- all I could find where bunches of white stumps from Belgium. Guess I’ll have to wait for the next primeurs in March. This entry was posted in Travel in France and tagged loire valley, restaurants, travel, vegetables. Bookmark the permalink. During spring season on the Languedoc-Roussillon (south east of France), wild asparagus naturally grow their tender stalks on the garrigue. Often green twigs of two to four millimeters diameter (sometimes over one meter long ! ), moved by a wind called tramontana, spring up from bushes of chenes kermes (kermes oak ?). Tips of wild asparagus omelette is a tasty dish that you can serve with a red or rose Saint-Chinian wine.